Burma migrant workers and labor activists from Thailand’s Tak Province at the Thai-Burma border have urged Burma and Thai governments to assist them in getting full labor rights under the Thai law. 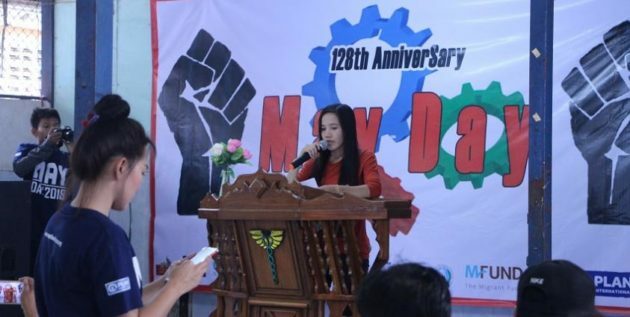 A ceremony marking the 128th anniversary of the International Workers’ Day was held at Mae Tao Ward in Mae Sot, Tak Province in Thailand on May 1. U Moe Kyaw, an officer from Yaung Chi Oo Workers’ Association, called for respective governments to assist the migrant workers as most of the migrant workers in Mae Sot area do not receive the daily wage of Bt 310 as stipulated under the Thai law for legal migrant workers and their labor rights have been violated including the extortion of Thai employers. “A daily wage of Bt 310 is rarely given in Mae Sot area. Also, if something happens to the workers at work, a group of workers get fired or are driven out. I want to urge the officials from both countries to handle this labor issue systematically with genuine good-will,” he told Karen News. U Moe Kyaw added that the majority of the migrant workers are still facing lack of workplace safety and health rights and they have to work more than official eight hours. “Worker’s rights are still being violated in Thailand. We want any organizations working for human rights and officials to assist us effectively on this. The workers in Mae Sot have received official documents after paying fixed charges, but their salaries are still being exploited. We want respective officials to investigate this and assist us in order for them to receive full salaries,” said Ko Thar Gyi, managing director of a group assisting Burmese migrant workers in Thailand. Over 300 participants including workers and local authorities attended the International Workers’ Day ceremony led by Yaung Chi Oo Workers’ Association. Respective labor leaders talked about the history of May Day, labor rights in Thailand, and stipulations in the law and some workers shared how their rights are being violated in the workplace. “We are losing all of our labor rights. When others paid Bt 3,700 for the documents, we also paid Bt 3,700 for the documents. When others paid Bt 6,000, we also paid Bt 6,000. But our salaries are very low. We have to work from 7:30 am to over 5 pm (10 hours) each day but we only get Bt 200 per day. Since we have to live with the boss, they confiscated our documents and don’t give them back even if we want to change our jobs. We want to do this with the assistance of labor organizations, but we are afraid of being killed,” said Ma Maw Htay, a farmer who attended the May Day ceremony. Between two and three million migrant workers from Burma are working in various industries in Thailand and over 400,000 migrant workers are working in Tak Province, according to labor rights activists. May 1 has been chosen as the Workers’ Day to commemorate the day workers shed their bloods in their struggle for an eight-hour work day over 100 years ago and workers are still demanding their rights even up to today. The 128th anniversary of the International Workers’ Day was celebrated across the world including in Burma and Thailand.